Map illustrating the Bordeaux Wine Region and neighboring Armagnac Region. Le Gouvernement General de Guienne et Gascogne. 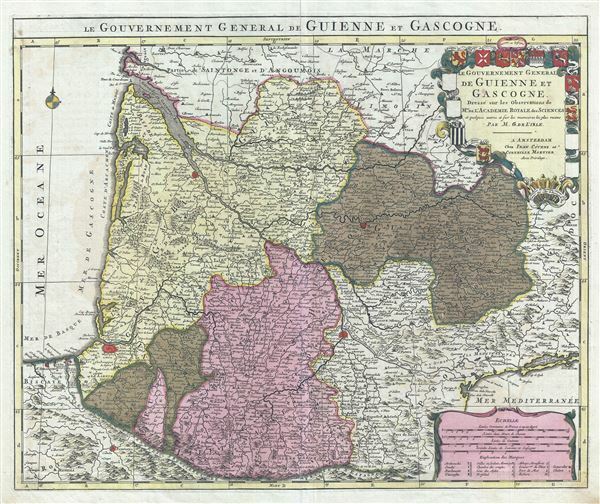 This is a fascinating 1742 map of the modern French departments of Gironde, Gascony (Gascogne), and Guyenne. This coastal region is the seat of the Bordeaux wine region and produces many of the world's finest reds. Shows numerous vineyards and chateaux. Also details the neighboring district of Gascony, home to Armagnac. There is an elaborate title cartouche in the upper right quadrant bearing various armorial crests specific to the region. This map was originally drawn by the prominent French cartographer Guillaume Delisle (De L'Isle). The plates form Delisle's atlas were later acquired by the Amsterdam publishing house of Covens and Mortier, who reissued his maps with dramatic Dutch style colorwork. The present map came from the 1742 Covens and Mortier Amsterdam edition of Delisle's Atlas Nouveau. Delisle, G., Atlas Nouveau, Contenant Toutes Les Parties Du Monde, Ou sont exactement Remarquees les Empires, Monarchies, Royaumes, Etats, Republiques and c. Par Guillaume de l'Isle. Premier Geographe de sa Majeste, (Amsterdam: Covens and Mortier) 1742. Very good. Original centerfold. Platemark visible. Old Color. Reinforcement on verso. Repaired centerfold separation.